This post is in paid partnership with Grove Collaborative, which I’ve loved for the last year since I first discovered them. And I’m pretty sure their favorite season is fall. Or maybe spring. The other day on Instagram, someone made a comment about how they have a personal theory that the majority of people most like the season they were born in. Turns out, that’s true for me! My birthday is in mid-September and I’ve always strongly felt like it was the BEST time to be born. I love everything about autumn – the crisp air, the calm before the holiday season, the beautiful fall leaves, the coziness – basically every bit of the season. I also love school (zero surprise there), so that back-to-school season is completely thrilling to me. There’s nothing quite like that part-thrilling, part-terrifying first day and it never got old for me. I spent most of my childhood in Las Vegas, so fall was always very delayed by the heat. Our first days of school were spent in triple-digit temperatures, and I remember wearing a coat ONE day to school as a senior and all my friends at the lunch table dying laughing over how ridiculous it was to wear an actual coat. Basically, it’s rarely gets above jacket weather. Before we lived in Las Vegas, though, we lived in Wisconsin, where my dad grew up, and we’d return most Septembers or Octobers to visit my grandparents. Every time, the leaves would be spectacular and the whole state smelled like a perfect crisp fall day. We’d visit an apple farm we’d been going to since I was a tiny girl. We’d have hot apple pie with ice cream and buy pumpkin fudge and play in the hay barn. We’d go through the corn maze and take home some pumpkins for my grandmother’s front porch. Back at their house, my dad would rake the leaves in the backyard and we’d jump into them over and over again. When Bart and I moved to Texas, our neighborhood had spectacular big trees and although fall was still late, thanks to the hot climate, when the weather cooled down in early November, the colors all over our neighborhood took my breath away. For the past three years in Arizona, I’ve felt like September has been a little bit of a hold-your-breath month for me. It’s still insanely hot (I just looked at my weather app and the coolest day in the next week is 101) and it’s going to be for another solid two months. Everyone on Instagram starts whipping out sweaters and scarves and hot cocoa, and I was still taking my girls swimming three times a week. The leaves don’t really start changing and falling until January, by which point everyone is totally over autumn. All of which is to say that moving to Utah feels like I’ve gotten the gift of autumn back in my life. Although the days are still plenty warm right now, when I go for a run in the morning, the air is crisp and cool. Last week, I ordered myself a few sweaters. The first signs of fall are appearing on the mountains as the leaves change from green to orange and red and yellow. I am basically beside myself with joy. 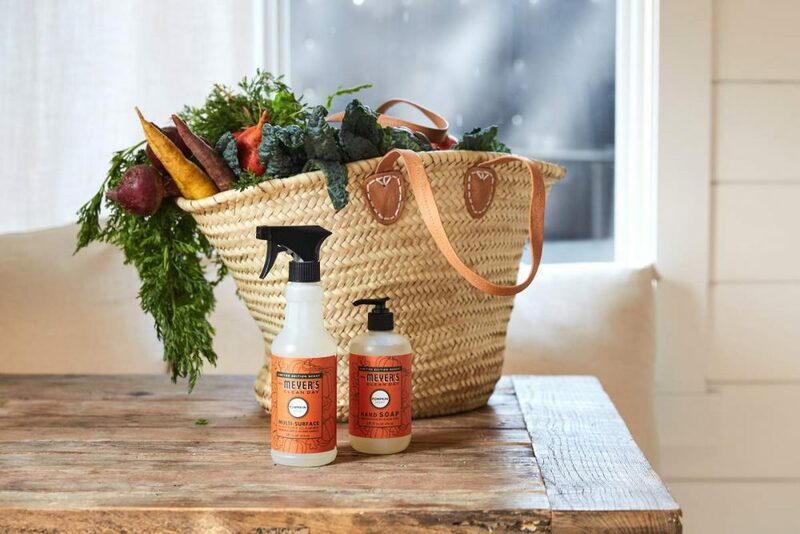 Since I can’t wear my new sweaters quite yet (88 degrees might be a little warm), I also ordered the new Mrs. Meyers’ trio of Fall products from Grove Collaborative. If you’re not familiar with Grove Collaborative, they’re the best place to buy natural products online. 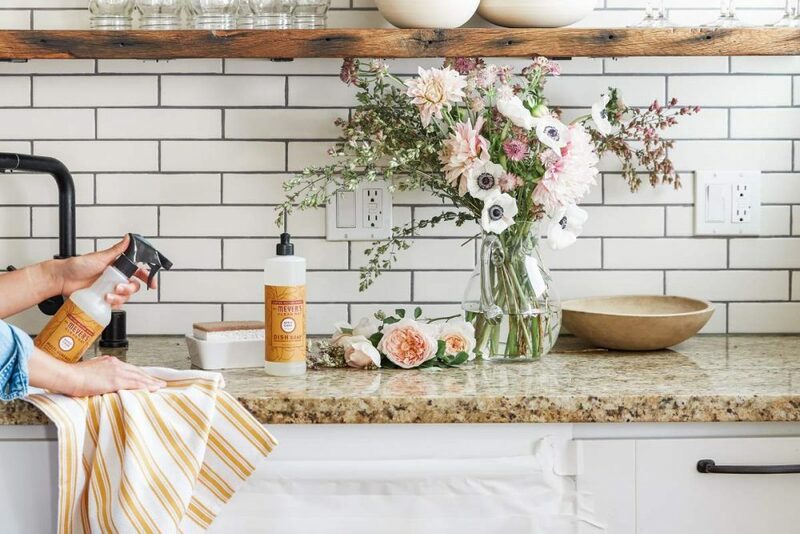 Whether you’re looking for cleaning products that are better for your family or sunscreen or personal care items, they pretty much sell it all. 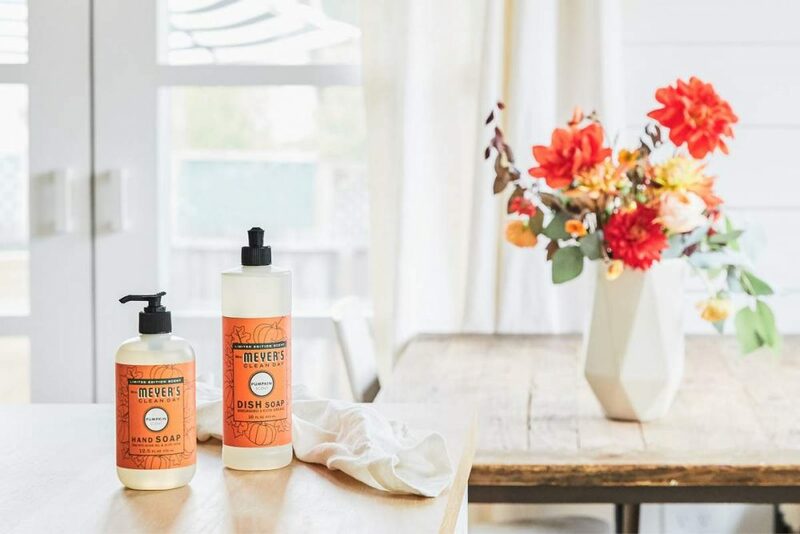 Some of the products are from well-known brands like Mrs. Meyers’ or Method and they also sell their own line of products, which I’ve been super impressed by since I started using them nearly a year ago. I first fell in love with Mrs. Meyers’ when my mom gave all her friends the multi-surface spray as a Christmas gift (I think every one of them told her thank you for not bringing more goodies). My sister Landen is also a massive fan (she actually was a finalist in a huge nationwide contest Mrs. Meyers’ held a few years ago!). So when the fall scents released and it aligned with living somewhere that actually HAS a fall? You know I was all in. 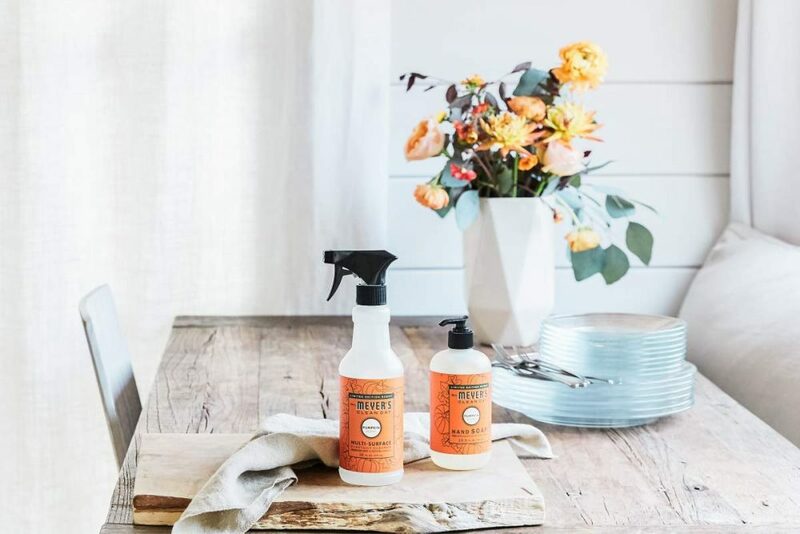 If you’re new to Grove Collaborative, they’ll send you the whole set of Mrs. Meyer’s products (hand soap, dish soap, and multi-surface spray) for free when you place your first order of $20. (Might I recommend the Wool Dryer Balls & Essential Oil set? It’s $20.95 so it’ll just about perfectly meet that $20 minimum and they last forever and smell amazing). You can pick from the new Pumpkin scent or Apple Cider or Mum. You 100% cannot go wrong with any of them. 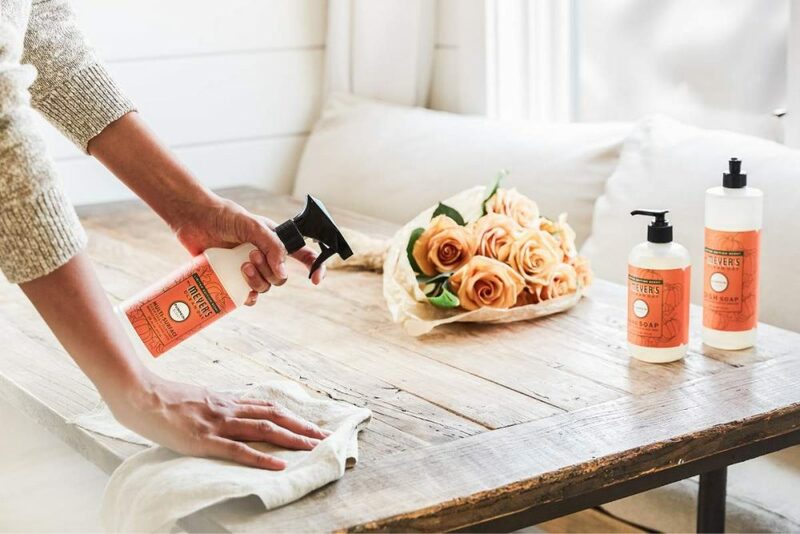 AND, they’ll throw in a replaceable head dish brush with a bamboo handle, plus free shipping and a 60 day VIP trial (if you spend $39, you’ll also receive a free Grove cleaning caddy to organize all your favorite supplies). If you’re already a Grove customer, you get a free set of Grove walnut scrubbers (I can’t wait for mine – I foolishly packed my scrubbers when we were boxing up our whole house!). If you’ve been thinking about trying Grove Collaborative, this is your chance (or if you just like free stuff, which. . .you knowI do too!). Sign up for Grove Collaborative here. You will receive the Mrs. Meyers’ free trio offer as soon as you sign up! Ta-da! Click Finish & Pay and place your order. And of course, the most important question of all is. . . what’s your favorite season? (My money is on not one person saying winter). Previous Post: « Is There Anything Better than Free Books? Fall and winter. Give me all the snow w and freezing temperatures. I hate being hot and, after spending 23 years in Vegas, I feel like I’ve earned the right to dislike summer. Fall!! September is my birthday month too!! I loooove fall & winter! Even in winter in Boston when it was so cold & snowy my contacts would freeze to my eyeballs for a second when I stepped outside! ?? Fall is definitely my favorite season, but my birthday is is January. I love the crisp weather and everything apple and pumpkin. Plus fall contains Thanksgiving, which is my favorite holiday. I love wearing jeans and a sweater/sweatshirt without a coat. I live in Wisconsin, and the falls here are pretty great, although the leaves aren’t quite as beautiful as they were on the east coast where I grew up. ha. idk if this is from your insta story last week, but these are the best-looking pictures you’ve ever posted. love it. Yes! I definitely think there is something to your favorite season being the one you are born in! I’m a summer baby and it’s always been my favorite. In fact, July (my birthday month) is the single best month, in my opinion. My sons are both March…which is kinda a crappy time of year to be born, usually just wet and muddy and gross out. When they get a little bigger I’ll have to see if the theory holds. Spring! Winter is my least favorite season (and I was born in December) and there is nothing like a warm day after months of frigid temperatures.